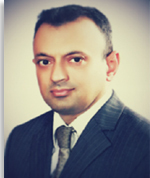 Dr. H. M. Anwaar Asghar completed his PhD in Chemical Engineering from the University of Manchester, UK. He has the privilege to conduct research work on an innovative and energy efficient waste water treatment technology in collaboration with the Arvia Technology Ltd. Soon after his graduation in Chemical Engineering, he worked as a Shift Engineer at polyester plant administered by Rupali Polyester Pvt. Ltd. After two years of hands on professional experience, he joined the Institute of Chemical Engineering as a lecturer in 2003. He has been serving as a lecturer and then Assistant Professor of Chemical Engineering for the last 14 years in the same organization. He has published 32 research articles in peer reviewed journals of national and international repute with a total impact factor of 58. He has presented/published 22 articles/extended abstracts in the proceedings of international conferences organized globally. He is considered to be an eminent expert in waste water treatment technologies. In addition to his area of expertise, he is keen to deal with three phase inverse fluidization, membrane and reverse osmosis technologies for waste water treatment applications.